Wildlife ponds, no matter the size, help provide safe heavens for native wildlife, including birds, insects, and amphibians. 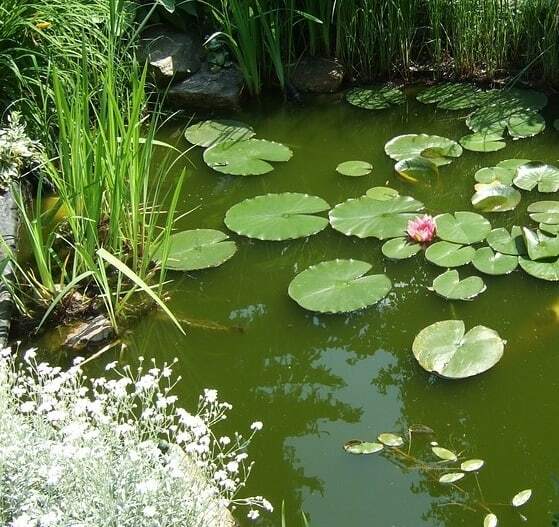 With natural ponds disappearing worldwide by an average of 50%, having a garden pond can (and does!) provide a host of benefits for all kinds of wildlife. For example, waterfowl may use your pond as a critical, but brief (usually just a day or two) stopping point during their migration for the winter. During hot weather, your pond will provide an oasis to rehydrate and cool down. Other species, like newts, frogs, and salamanders, are completely dependent on water systems like ponds for breeding and raising young in the spring and summer while utilizing the protective, moist mud to burrow into to survive the winter. Your pond will likely also have plants and flowers, which will attract insects and pollinators that are critical for overall ecosystem health. To illustrate the importance of this, about 50% of bee species in Europe have gone extinct, with another 25% in danger of doing so (these numbers are at about 40% and 30% for the United States). This poses a threat not only to all manner of ecosystems, but humanity as well. Your seemingly insignificant pond is far from actually being insignificant, and can really be a safe haven for all manner of wildlife. Can You Have Fish In Wildlife Ponds? It’s not common to have fish in wildlife ponds, as they have additional needs and may be taken by larger predators. Technically, yes, but many pond owners choose not to have fish and instead opt for a fully natural “hands-off” eco-system. This is because wildlife may damage or consume the fish, so it’s best to not have ornamental varieties like koi and goldfish when your pond is an attractive prospect for larger predators. In addition, the fish will eat some of the wildlife residents, like frog eggs and tadpoles. It’s best to either leave fish absent, or see if any native species wind up there naturally (sometimes birds inadvertently introduce fish to areas by eggs sticking onto their legs and feathers). Because of the lack of fish, a garden wildlife pond won’t need as much filtration or equipment in general to keep it running. You’ll still certainly need to take care of it and monitor it, but one of the perks of having a wildlife pond is that you can take a step back now and then and allow nature to do its thing. Below we’ll cover some of the basics of taking care of your wildlife pond and really reaping the benefits of it. While wildlife ponds to a certain extent are able to naturally regulate themselves, you’ll likely need to take measures to control vegetative overgrowth and cut some back. This will depend upon species as well as location and time of the year. Although you should be planting in Spring, you need to be careful as many animals lay eggs during this period. In the spring, you’ll want to plant whatever vegetation that you intend on adding to the pond, as this is the time when growth and establishment will be most pronounced. Plants devote a great deal of energy to growth during this time, so there’s greater likelihood that they’ll survive being planted and be able to really establish themselves. For existing marginal, floating, or submerged plants, you may need to cut them back. Try to make sure that you don’t remove more than approximately a quarter of the total plant cover, as wildlife depend on it and may move to a different area if yours lacks adequate vegetation. During this time of year, everything is ramping up and coming to life – this means that you must be careful when planting and removing plants, taking care to disturb the pond as little as possible. Frogs, newts, toads, and some fish lay eggs during late winter/early spring, and some hatch during mid to late spring – too much disturbance could kill them. Insect larvae is also being laid and hatching during this time, and as insects are toward the bottom of the pond food chain, you’ll need these if you wish to support other wildlife. In summer, collecting rain water in barrels is good practice so you don’t need to use mains tap water for pond top ups. During the summer, most amphibians, reptiles, and insects like dragonflies will have hatched. You may also have bats, owls, and other such critters hunting around your pond. Warmer weather means that your water level may decrease, but don’t use a hose to fill it back up; the cold water and different water chemistry could shock the pond inhabitants and potentially kill them. Instead, keep some large containers outside to collect rainwater and fill up the pond with that if levels drop. Continue cutting back vegetation as needed, making sure again to never remove more than 25% of the total cover. Autumn is a time many plants go dormant, so it’s a good time to begin cutting back overgrown species and removing invasive ones. In autumn, many organisms may leave your pond, will things like frogs will burrow into the mud and overwinter. Most plants will start to die off, so you’ll need to clear them out so that their decomposition doesn’t use up precious oxygen during the winter. Now is also the best time to remove any invasive plant species, as they’ll be going dormant and are less likely to spread. Adding a variety of plants, including marginal, submerged, and floating, will attract more insects, birds and animal species. The greater diversity of plants that you have in and around your pond, the more different types of wildlife you will attract and be able to support. For example, large-leaved floating plants such as lilies enable frogs to lay their eggs beneath the leaves, while marginal plants along the edge of the pond such as sedges, hostas, and ferns, will attract frogs to ponds initially and provide hiding and breeding habitat for them. As covered in our duck article, you can attract particular types of waterfowl based on the types of plants that you utilize. For example, some species like both blue-winged teals and green-winged teals prefer grasses and other low vegetation surrounding the pond for them to nest and hide in, while canvasbacks prefer floating vegetation that form mats that they can roost and nest on. Algae can be beneficial to natural ponds, but too much can cause issues with water quality, waste, and plant growth. While having some algae is natural and healthy (actually, it’s often crucial for aquatic ecosystem health and proper functioning! ), having too much is most certainly an issue. You can prevent overgrowth by planting trees near your pond (like those covered in our article on trees that are safe to plant near ponds) to provide shade, and thus deter algae growth. Algae generally love light and warmth, so limiting the amount of sunlight that hits the water will in turn limit the extent to which algae can grow. You can also use a rake to scoop out or vacuum the algae if there are significant amounts of it, particularly if it has formed dense mats that are difficult to remove otherwise. Another option is to use natural products (remember, any chemical meant to kill one thing absolutely has the potential to cause harm to other life forms, like fish, birds, and any other pond visitors). Products considered safe for ponds include barley straw, ultraviolet clarifiers, and some algaecides (though these do come with potential drawbacks). For example, green clean is a natural algaecide, but reportedly can be toxic to bees and certain birds, so you would need to be careful depending on your native species. Bottom sediment is vital for wildlife ponds, but too much will deter wildlife and prevent plants from growing properly. This will take many years to occur (depending upon the size of the pond and the amount of plants and wildlife inhabiting it), but after a time sediment will begin to build up. This sediment will continue to build as more and more waste accumulates such as leaves and dead vegetation, dead fish or other small creatures, nutrients, and excrement. Eventually, this results in the pond becoming more and more shallow, and when left to nature ponds eventually cease to be ponds. This won’t be the case with yours, of course, as you’ll be maintaining it! Make sure to scoop out the majority of dead/dying things at the bottom of the pond each fall/spring, and if needed scoop out a couple inches of sediment if your water is becoming more shallow. Too shallow of a pond (less than a foot, typically) will deter some organisms from remaining in your pond and lessen the ability of anything to survive in your pond during the winter. However, keep in mind that a fair amount of sediment is necessary in natural ponds, and the enzymes and anaerobic activities taking place in the sediment can help to deter some algae growth. You should try to avoid removing sediment for the first few years of your pond’s life, as having it will really help to build a healthy ecosystem that attracts a plethora of wildlife. Shading a pond should only be considered in extreme weather, and should not be necessary if you have trees for natural shade. Shading your pond should only be done under extreme circumstances, such as drought, to prevent water loss and protect the organisms within it. Otherwise, using a cover will block sunlight and could be a detriment to your pond and keep wildlife from getting to it. Only use one if you’re very certain that there will be little to no rain, and don’t leave it on any longer than necessary (using it during the heat of the day and removing it at night is a decent option if you feel you must use the topper for longer than a day, though this may still damage the pond and its residents). As a natural, long-term alternative, you could consider planting native species of trees around the pond to provide partial shade in summer, whilst also attracting more wildlife. For wildlife to access your pond, you should check seasonally that slopes are still accessible and not too steep. You should have at least one side of your pond that is sloped and shallow, to allow wildlife easy access in and out. As covered in one of our previous articles on frogs, an angle of 45° or less is best. You can include logs and/or rocks to allow access (and roosting/sunbathing spots) for birds, turtles, and frogs, but make sure several feet of the slope is left open and clear to let in things like deer, large waterfowl that are trying to land, and so on. Shorebirds, raccoons, and foxes (among others) will utilize the shallow water to bathe, drink, and search for any invertebrates that are in the substrate. Insects, like dragonflies, bees, and butterflies, will land on shallow water to grab a quick drink. As with any pond, keeping your equipment clean is essential. Regularly (about once a week) check and clean out aerators and pumps, and a bit less frequently clean out any waterfalls and fountains that are present. While wildlife ponds should have some degree of detritus, use a net or rake to remove any substantial amounts of leaves, sticks, or anything dead.